Most people believe that karmic seeds from the past remain buried in the superconsciousness and subconscious mind which consists of three brains, physical, astral and ideational. Dormant traces of bad karma and bad habits are very well implanted there and they are known as samskaras. These traces of bad karma and bad habits remain inside the astral brain when one dies and leaves the body. They return back life after life. However, the spiritual master explains that many latent desires from past incarnations also reside and wait in the spinal region ready to spring forth when karmic conditions are right, ready to germinate in a karmically defined time either physically or mentally. The most important part of our being is our inner-spine. Since most people do not meditate we can’t prevent our feelings from residing in the three lower chakras of our spine which causes more than forty emotional and physiological imbalances such as worry, criticism, suspicion, gossip and so on. All unfulfilled desires follow us through incarnations and that every desire consists of certain forces with magnetic fields of attraction and repulsion. All this energy in our lower chakras is weak and unawakend locked up at the base of the spine as the power of repulsion drags it down like gravity right into our five senses. 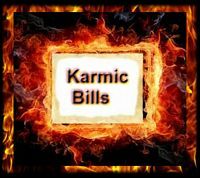 You can work through and pay your karmic bills as they come, or burn the cause and effect tendencies in the fires of Kriya meditation to avoid suffering. When practicing Kriya, the current which is revolved around the spine is so intense that it burns the seeds of karma as they are literally baked. Kriya Yoga, an instrument that can bypass the karmic law of cause and effect where man can avoid reaping the consequences of his wrongful actions for breaking the cosmic laws accumulated from wrongful actions. To escape from cosmic laws that govern every single human action is literally impossible; the judgments of the law of karma must be compensated in fair exchange or in kind. Kriya Yoga is an advanced technique of Raja Yoga that revitalizes and reinforces subtle currents of life energy in the body, the same spiritual science that Krishna had instructed ages ago to Arjuna and which was later known to Christ, Patanjali, St. Paul, St. John and other disciples as the tool through which human evolution can be quickened making it possible in time to be wholly or partially free from adverse effects of karmic causations. The Kriya beginner may employ this yogic exercise only fourteen to twenty-eight times as the beginner doing this intense meditation practice is required to spend a minimum of six and a half to seven minutes twice a day, the equivalent of twenty eight years of natural unfoldment. Each technique duplicates the cosmic motion of nature in ½ minute producing a motion of current going up and down the chakras in the spine giving you one year of natural evolution each time you execute one Kriya Yoga technique. Practicing the science of Kriya Yoga is not drudgery since gradual transforming effects are noticed from the very start. However some beginners have a presumption of instant spiritual achievement maybe more than a little presumptuous when you consider the innumerable incarnations previously spent in making one’s self an unspiritual being. Practicing even for a lifetime is little to be expected. Liberating oneself from the justice of cause and effect is not a simple matter of doing a few prayers and affirmations or haphazard attempts at meditating. It can only be accomplished by persistent practice of the great science of Kriya Yoga. A man who dies before achieving his goal carries with him the good karma of his past Kriya effort; in his next incarnation he is harmoniously propelled toward his supreme goal. Remember what Jesus said, “The harvest is plenteous, but few are the laborers in the field.” If you start on the path you must willingly labor to the end, before liberty is reached. God knows man’s innermost desires and thoughts; the sincere man will receive the necessary strength which will allow him to attain victory in all battles. Have you wondered about how a few men became exalted beings, gurus, and great self-realized masters, enlightened or liberated? The path to self-realization is (Raja Yoga) Kriya Yoga. What do you want to be, a man walking with a soul or a soul walking with a body totally aware of its divine nature? God would not have given us the liberating techniques of yoga meditation or the desire to know him if He were not planning to release us. Listening to your conscience is key, that is God’s cosmic intelligence vibrating through you. Every time you interfere with your conscience you revert back to ego consciousness, duality and ignorance. We all have human intelligence which endlessly lies to us and we have divine intelligence and our conscience. If you choose wrong your other choice is that of the unenlightened masses, who must go through thousands and thousands of incarnations to be karma free and enlightened automatically as the earth rotates around the sun in three hundred and sixty five days going around the twelve signs of the zodiac whereas the school of hard knocks in life must become your teacher. For those who want proof read the chapter “The Science of Kriya Yoga” in the book or online “Autobiography of a Yogi” by Paramahansa Yogananda, which explains the actual meditation technique of burning off karma in great detail. To learn the technique contact the Self-Realization Fellowship in Los Angeles, California to have the lessons mailed to your home.